This set of #711 11 Pc. 12 Pt. 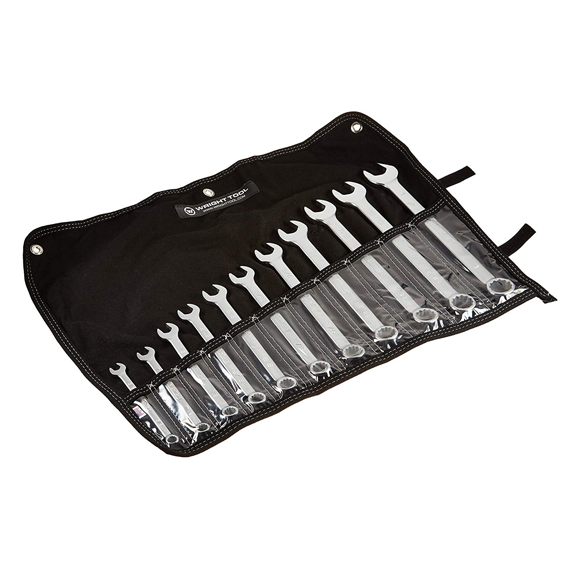 Wright Grip 2.0 Metric Combination Wrenches from Wright Tool includes a 3/8", 7/16", 1/2", 9/16", 5/8", 11/16", 3/4", 13/16", 7/8", 15/16", and 1" wrench, plus a matching washable Denim Tool Roll. Wright Tool's advanced opening profile places more metal in high-stress areas to stiffen the jaws, increase tool strength and reduce permanent jaw spread. As a standard feature on the Wright open-end of combination wrenches, precision placed protrusions are custom engineered for each wrench size to keep it seated on the fastener, increase torque and reduce slippage. They have 50% more protrusion engagement than all other wrenches.